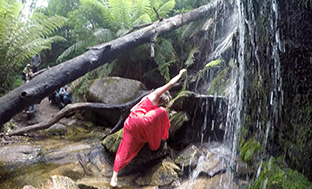 "Water Fall" was developed as part of Arts House’s program Time Place Space:NOMAD in Wotjobaluk Country of the Wergeia Language Group in December 2016 then filmed on Mount Buangor State Park, Bukkertillible Walk on our way home. Dancers: Ngioka Bunda-Heath and Baden Hitchcock. 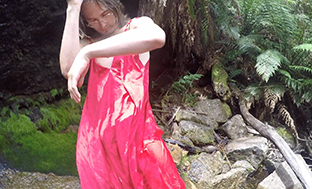 Video & Field recordings: Sarah Jane Pell. 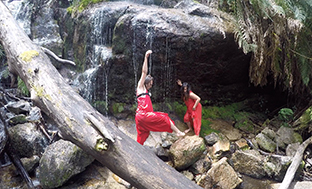 So often our identity in dance is a struggle between the head and heart: between homeland and heartland, between intellectualised and embodied knowledge, between a rock and the water that falls and wears it down. Ngioka perfoms with a GoPro mounted on her head. 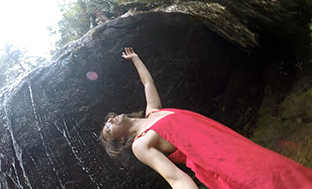 Baden performs with a GoPro mounted on his chest. Their perspectives are intertwined under the canopy of the lush forest of the Bukkertillible Walk. Neither of their people come from this place, but their dance honours and reflects the ancient cultures and beauty of this young country. Or is it young cultures, and ancient country? Again, a head and heart identitiy question for contemporary indiegnous dancers. All we can do it watch, and admire, their courtship. Not once they slip on these rocks. 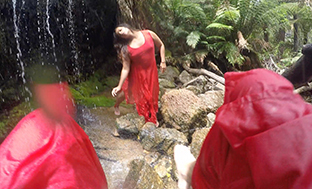 Ngioka is a Wakka Wakka and Nugi (QLD) woman on her maternal side, and Biripi (NSW) on her father's side. Baden's maternal ancestors come from Saibai Island in the Torres Straits. I was born to British ancestory on Wurundjeri country. All three of us studied at Victorian College of the Arts on land of the Koolin Nation. We respectfully acknowledge the people of the Boon Wurrung and the Woi Wurrung who have danced their dances, sung their songs and lived their culture on that land for tens of thousand of years. As contemporary artists, we search for meaningful ways to express culture as forms of language are created, expanded or dissolved. Our practice mediates across identities and communities, our art echoes concepts of time, place and space that are marred and scarred by politics, and our bodies share both the sacred and the shock of the new. This is us here now today yarnin.